Dynamic Journeys Travel is a full-service, boutique travel agency serving the needs of highly discerning travelers. We specialize in creating luxurious vacations of a lifetime that are considerate of your budget, interests and activity level. Enrich your life with a vacation planned by Dynamic Journeys Travel. When consulting with us, the utmost care and attention to detail is taken into account while tailoring your travel experience. Expect an unmatched level of personal service. Countless hours of research and many personal visits to the properties you will visit help ensure that you are matched with the correct itinerary. We have "insider" connections and vast knowledge of the destinations to which you will visit. Our vacations will leave you rejuvenated with stories of adventure that you will be telling for the rest of your life. Dynamic Journeys Travel takes into consideration your expectations, desires, passions, accommodation preferences, activity level, budget and travel goals. Vacations are a time when "ordinary" is not good enough. You've worked hard and most likely have few leisure days each year. Let Dynamic Journeys Travel handle the travel details for you, so your only tasks will be relaxation, exploration and of course, fun! 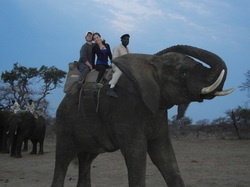 Dynamic Journeys Travel was founded by Sarah Moretz, an enthusiastic globe trekker. With a passion for travel and quest to live life to the fullest, Moretz has a reputation of providing her clients with the ultimate luxury travel experiences tailored to their individual tastes. Having traveled extensively herself, Moretz understands the requirements and interests of sophisticated and adventurous travelers. A North Carolina native, Moretz has spent a great deal of her life traveling. She took her first flight at the age of 5 to Walt Disney World. During that vacation with her grandparents, she was bitten by the travel bug. After hearing of their worldwide travels, she wanted to create her own adventures, thus Dynamic Journeys Travel was eventually founded. Moretz graduated with degrees in Communications and Computer Information Systems from Appalachian State University. She’s traveled from Japan to South Africa and many countries in between, including remote parts of the South Pacific, Africa and Asia. Moretz has kayaked to and snorkeled around many isolated islands of Fiji; swam to the edge of Victoria Falls in Zambia; experienced the majestic grace of elephants while elephant trekking through the Golden Triangle; peered into the world of the Geishas in Japan; heard amazing singing in bures in Kadavu, Fiji; and had the thrill of interacting with great white sharks in Gansbaai, South Africa. Allow her to help you create lifelong amazing memories.